Lefty's San Francisco and Leftyslefthanded.com has an unparalleled selection of left-handed products. www.leftyslefthanded.com is the online store of Lefty's San Francisco: The Left Hand Store. In 1978, the Left Hand World opened on PIER 39 in San Francisco in a little 350 square foot space. It was the very first store in the United States to specialize in products for left-handers. After more than a decade it closed due to family illness, but remained in the minds of many lefties and their friends and families. The management of PIER 39 regularly fielded queries from guests about the store. 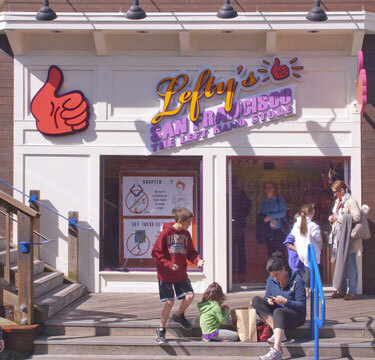 When the original location of Left Hand World became available again, the PIER asked us to bring it back --- so in 2008, 30 years after its original opening, reinvented and modernized, we brought you Lefty's San Francisco, in the original location - downstairs, halfway down Pier 39, on the Embarcadero in San Francisco. Lefty's was instantly so popular that it was completely packed much of the time. In 2011, we moved to a much larger space a few doors away. We invite you to visit the store when you are in town, and if you can't make it to San Francisco, shop here at our website, www.leftyslefthanded.com. A limited selection of our best items can be found at our Lefty's kiosk at Downtown Disney, The Marketplace, Walt Disney World Resorts, Orlando, Florida. Please note: We are a very small company and currently there is no phone number for the web site, however we answer all emails usually within hours, and always within 24 hours.